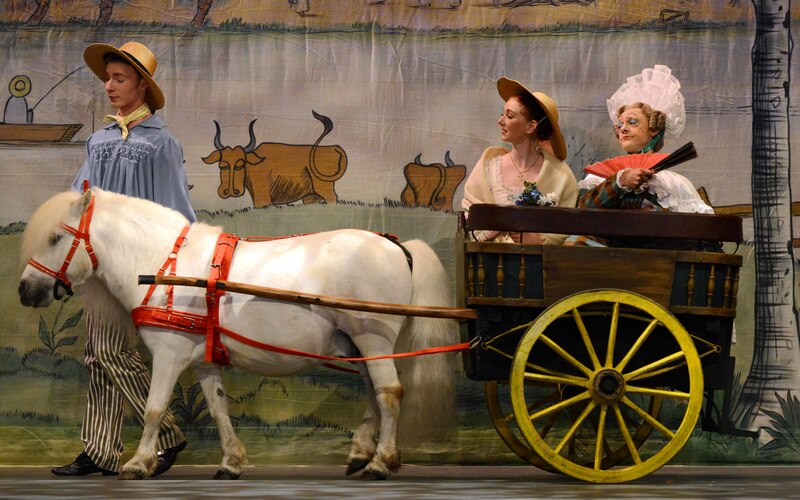 This ballet is an age-old favourite, dating back to 1960, but after nearly 60 years, has La Fille Mal Gardee lost any of its charm? Returning to Birmingham Hippodrome, this ballet that was created by master choreographer Frederick Ashton is part of the latest tour by Birmingham Royal Ballet (BRB). I caught it in Birmingham, where it stays until Saturday before continuing on to theatres including The Lowry in Salford, Theatre Royal Plymouth and Sadler's Wells in London. It's a big production with three different sets, a big cast of dancers, some endearing special effects and even a Shetland pony. In fact, this show was been going on for so long that I have it on good authority that the pony used is a direct descendant of the original one used in the Ashton premiere in 1960. Although Ashton created over 100 works, this ballet is close to many dancers' hearts as it is fun, frivolous and gives an opportunity for some great character acting. Set in the countryside, it follows sprightly young Lise as she avoids the matchmaking antics of her widowed mother, Simone. Simone wants Lise to marry the oafish son of the local rich man rather than follow her heart and wed a poor but handsome cheeky young farmer. 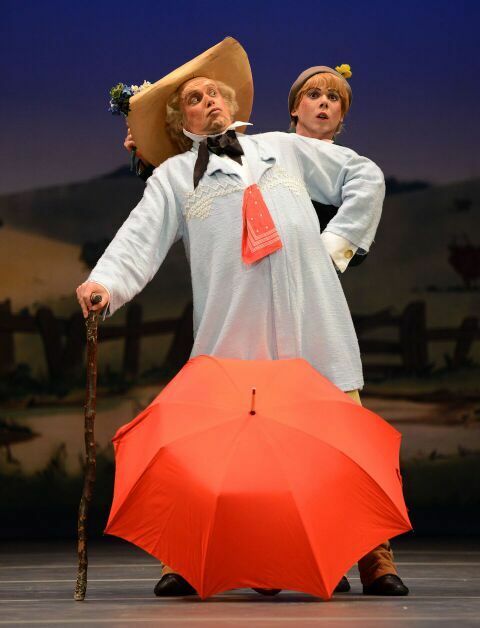 What's lovely about this ballet is that it's a light-hearted romance with bursts of comedy too. Everything about it is delightful and fun including the dancing, whether it's a maypole dance or clever routines with ribbons. There's also thoroughly endearing pas du deuxs between the two lovers. The sequence where Lise is embraced tenderly and swayed from side to side through the front door is so beautifully choreographed. It would melt the coldest of hearts. Setting the breezy mood is the staging, which consists of cartoon drawings in pastel shades. 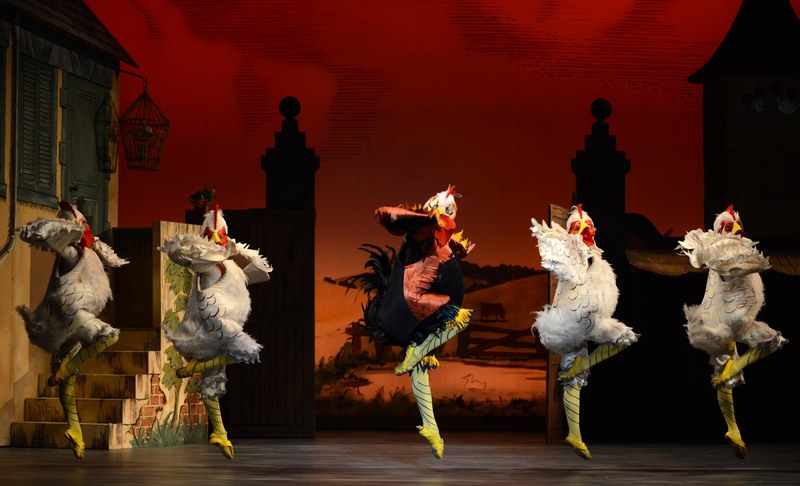 Meanwhile, chickens dance around the stage and reappear at various points. 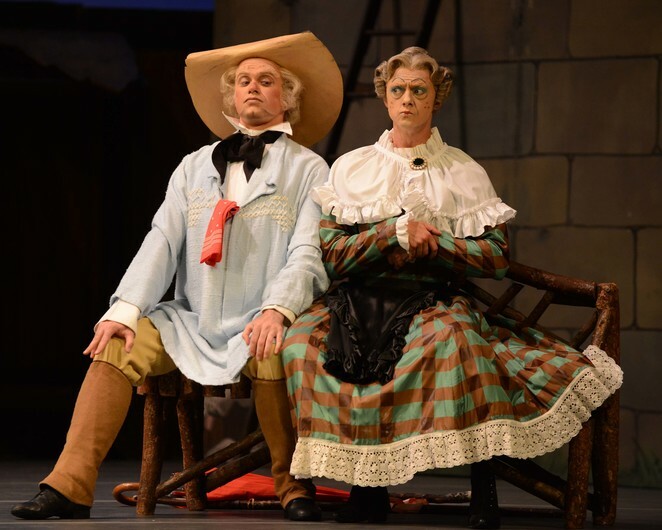 There's wonderful pantomime characters too of Lise's mother Simone and the idiotic Alain, son of the wealthy vineyard owner. These two provide light relief yet also some remarkable dancing sequences that need an awful lot of technique to look so bad. Simone has the famous 'clog dance' while Alain has quirky moves and solos that are always a pleasure. Playing Simone, in drag, is experienced Michael O'Hare, who is now a senior ballet master as well. Many may remember him in another character-led role of Dr Coppelius in BRB's Coppelia. While soloist James Barton gives energy and oafishness to Alain. The charming romance and coquettish dances between the leads take us through the first two acts which conclude with an action-packed storm that ramps the drama up to another level. The final act carries on with the humour but also some of the most enchanting moments between the lovers, danced beautifully by Momoko Hirata and Mathias Dingman. Dingman is perfect for the role, playing it with full-on cheekiness and charm. Together the pair are a treat. This ballet may have been performed several times over the years by BRB but it never loses its charm. It's a timeless classic that is a joy. You can't help but fall in love with it.